Synopsis: Two years ago, Fever Crumb escaped the war-torn city of London in a travelling theatre. Now she arrives in the extraordinary craer city of Mayda, where buildings ascend the cliffs on funicular rails, and a mysterious recluse is building a machine that can fly. Fever is the engineer he needs - but ruthless enemies will kill to possess their secrets. The fabulous sixth book in the Mortal Engines series, from the brilliant and award-winning Philip Reeve. Two years have passed since Fever Crumb ran away from her London home: since then, she has become less and less rational, struggling to cope with new and profound feelings that since childhood, she has been taught to supress. Now, after the few years of travelling with a theatre company, she has arrived in Mayda, an odd little island town, and living on Mayda is a young man, eager to unleash the secrets of flight. They will not be alone. Powerful enemies are eager to steal or destroy their findings…. Ever since Mortal Engines was published, the stories have always taken place in London or about London. A Web of Air brings a fresh new light to the world of Mortal Engines, though; set in a curious town with a Mediterranean climate, it is a breath of fresh air amongst the otherwise London based stories. I really enjoyed discovering this new, faraway corner of the world, and Philip Reeve has done another great job at bringing Mayda to life in it’s own way; gone are industrious estates, and in their place are Mediterranean houses and people with tanned skin, blissfully unaware of what is brewing in London and many other great cities. For character development, A Web of Air seems even better than the original Fever Crumb; after 2 years of absence from London and other ‘rational’ thinkers, Fever is starting to question it all, which at some points makes it very juicy and amusing to read. Arlo is also an intriguing character, and without him A Web of Air would have been a lot less good (and, for that matter, probably not have been anything it is about now; Arlo Thursday is the character A Web of Air is primarily about). Philip Reeve’s Mortal Engines has always been more about the plot than the characters; while many characters were very interesting, they just didn’t possess that special something that really made them fantastic. 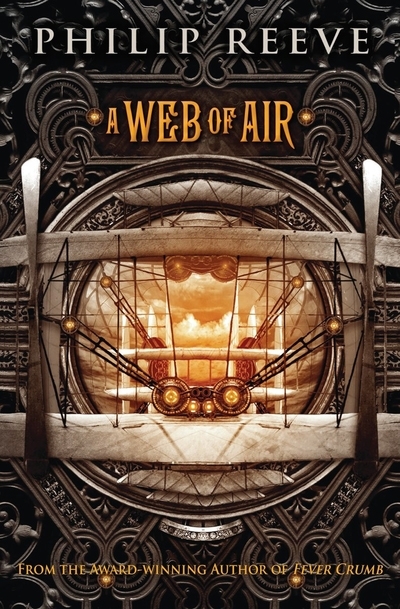 I don’t think A Web of Air is much different; while it certainly is better in terms of characters, what will draw people in is the setting and the plot. That isn’t to say that the characters are useless. They are good characters brought to life not-so-well, if you can understand that. In terms of the actual writing, it is very similar to Philip Reeve’s other works: beautifully described while still maintaining flow. There is something very artistic about how he writes, which is not surprising, as he was an illustrator before he got published. Anyhow, the vivid descriptions make Mayda and Thursday Island very real. World building has always been Philip Reeeve’s strong points. As a whole, A Web of Air is a refreshing and powerful novel, with cinematic descriptions and bold ideas that make the World of Mortal Engines what it is: a fantastic piece of contemporary storytelling.